What Is the Apple Watch? 1. What Is the Apple Watch? Apple’s first wearable was a source of speculation for well over a year before the Apple Watch was finally announced back in September 2014. Now that the launch of the sapphire screened timepiece is well within sight (Spring), Danielle, one of our developers here at Calvium, would like to share her thoughts and discoveries about the Apple Watch, culminating in a series of posts about an Apple Watch app that she is currently building. This is going to be an exciting new series discussing the potential around the upcoming Apple Watch. We’re going to introduce what the device is, what we can do with it, and begin a walk through creating an app which hooks into the watch features. Some posts will be aimed at more technical individuals interested in creating their own Apple Watch apps and will be highlighted as “technical”, however others (such as this one) are aimed at anyone interested in the Apple Watch. When released, the Apple Watch will come in two different sizes, 38mm and 42mm which refers to the height of the device, both of which can be set up for use on either your left or right wrist. There will be three different editions to choose between, a stainless steel Apple Watch, an anodised aluminum Apple Watch Sport, and an 18 carat gold Apple Watch Edition model. Owners will also be able to purchase various different straps out of leather, colourful plastic, or different metals to customise their watch to suit their tastes. One of the most interesting features of the new Apple Watch will be the introduction of Force Touch which enables the device to sense the force of a tap on the watch face. The watch will be able to sense the difference between a light tap, an actual press, or a deep press to enable different actions or interfaces. For example lightly tapping the watch will allow the user to customise their current watch face. 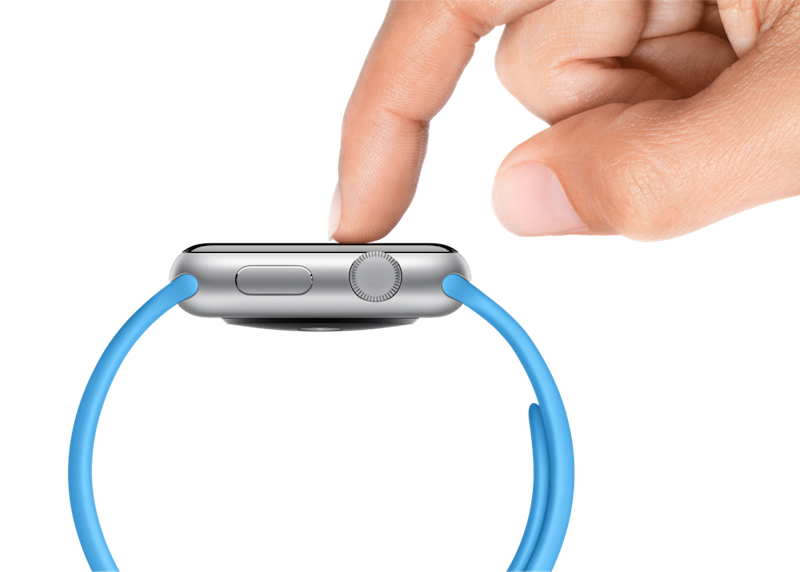 There are only going to be two physical “buttons” on the Apple Watch. The first of which is being referred to as a Digital Crown, this acts like a normal watch crown except instead of changing the time it will be used to zoom and scroll around the interface. This enables users to operate the watch without obstructing the interface with their fingers. Users will also be able to push the Digital Crown, much like they can press home button on an iPhone to return to the watches home screen. Finally, the second button located under the Digital Crown will enable a quick contacts menu which will display contacts you have recently contacted enabling you to quickly call, email, or iMessage them, much like the iOS already currently has when you double tap the home button. Apple Watch will contain a bunch of useful sensors and talk nicely to the sensors on your iPhone such as GPS. The watch will contain an accelerometer and a gyroscope to help detect movement and calculate how active your currently being, from being sedentary to standing up or actively working out. The watch also contains a heart rate sensor, which will be used to measure all kinds of interesting statistics related to your heart rate but probably the most fun will be the ability to “capture” your heart rate and send that to another Apple Watch user. This will then use the Taptic Engine to mimic your heart rate. 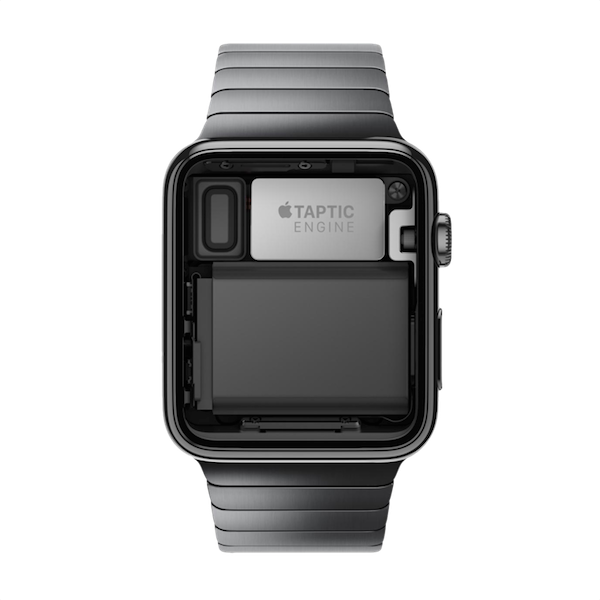 Another neat feature is the Taptic Engine inside the Apple Watch which provides tactile feedback to certain events, for example when you receive a push notification the watch will simulate someone tapping your wrist twice. You will also be able to set up unique expressions for different events. This feedback loop is supposed to be coupled closely with audio feedback. However, there is a lot of contradictory information surrounding whether there will actually be a speaker inside the watch; the product description describes a specially engineered speaker, however Apple have responded on the developer forums that there will be no speaker. I suspect that just means developers won’t be able to write code for producing sounds. The Apple Watch could be an exciting and innovative new piece of technology but what can we actually do with it? 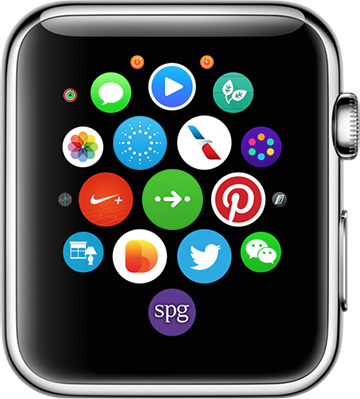 We’ll take a look next at that in our next blog with an introduction to the main things Apple Watch apps can do. Bristol Media’s Open Doors – The Calvium Quilt!